Waterloo East, also known as London Waterloo East, is a railway station in central London on the line from Charing Cross through London Bridge towards Kent, in the southeast of England. Although Waterloo East is a through station, it is classed for ticketing purposes as a central London terminus. Services through the station are operated by Southeastern and it falls within fare zone 1. 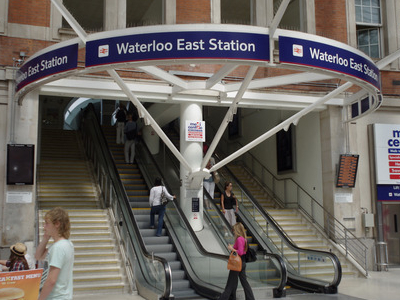 An elevated walkway across Waterloo Road connects it to the larger Waterloo Station and provides the main access. The eastern ends of Waterloo East platforms have pedestrian connection to Southwark station which is served by London Underground's Jubilee line; at street level there is a modest entrance in Sandell Street. There is no station building; the ticket office of the main station serves it, though there are ticket machines at the eastern end of the walkway. The four platforms at Waterloo East are lettered rather than numbered to avoid confusion with those of the adjoining Waterloo station, which is managed and branded separately (a stratagem also used for the Thameslink platforms at St. Pancras International and their predecessors at King's Cross Thameslink, and at New Cross), by staff who work at both stations. Ticket barriers have been installed at the Sandell Street and Southwark station entrances, and also at the main entrance from Waterloo station following the completion of the retail balcony. Here's the our members favorite photos of "Railway Stations near London Borough of Lambeth". Upload your photo of London Waterloo East Railway Station!